Over the past 36 Years, Scheid Vineyards has grown into one of California's largest independent producers of premium wine grapes. Over the past 36 Years, Scheid Vineyards has grown into one of California's largest independent producers of premium wine grapes, and a maker of distinctive wines that bear the Scheid name. The heritage of Scheid Vineyards is reflected in the winery's logo, a bold image of "Vin," a vineyard worker that honors Scheid's beginnings as a grape grower and the truism that great wine begins in the vineyard. Or, as Scheid likes to say, "It is the grapes." Scheid Vineyards consists of ten separate estate vineyards covering more than 70 miles, offering an array of soils, microclimates, and sub-appellations, and endless possibilities for producing fine wines. But less than two percent of Scheid's grapes are selected for its label. Because of this, only the finest vineyard blocks are chosen for the wines and only the best lots are selected for bottling. Each wine is handcrafted, using the best of new technology combined with traditional methods to showcase the varietal character of the grapes, the individuality of each vineyard, and the exceptional quality of the Monterey Viticultural Appellation. Visitors to historic Cannery Row are delighted to learn that Scheid Vineyards Wine Lounge has recently opened there, just a block from the Monterey Aquarium. The stylish 2,000-square-foot lounge features coffered ceilings, recycled hickory floors, and a rustic Carmel Valley stone fireplace--evoking an ideal environment for tasting Scheid wines. Fun, educational classes, like "The Art of Truffle Making," and hands-on hand-blending workshops are regular occurrences. Scheid's Estate winery and tasting room, located just off of Highway 101 between Greenfield and King City, is Scheid's home location set among the vineyards. The converted hundred-year-old barn is located about an hour from the Monterey Peninsula, yet set in a world apart. With a spacious outdoor deck, demonstration vineyard, and bocce ball court, it provides an ideal respite in the land that grows Scheid wines. There is also a Vineyard Guest House for private parties and a stairway leading to an observation deck, giving visitors a breathtaking view of Scheid's 150-acre Hacienda Vineyard. Corporate events, weddings, and the annual "Rootstock: Concert in the Vineyard" give wine lovers more reasons to visit Scheid in Greenfield. Those who cannot stop into one of Scheid's locations anytime soon are still eligible to join Vin's Wine & Social Club. Befittingly named after the winery's iconic image, the wine club offers an impressive number of options. Vin's Club ships six times each year, offering members two, four, six, or 12 bottles per shipment. Most popular is the four-bottle Mixed Club option, sending four unique wines (two white, two red) in each shipment. Considering Scheid's depth in variety (they grow 29 different varietals on ten estates located in four distinct growing regions in Monterey County), the wine club is able to offer its members an unrivaled tasting tour of Monterey. 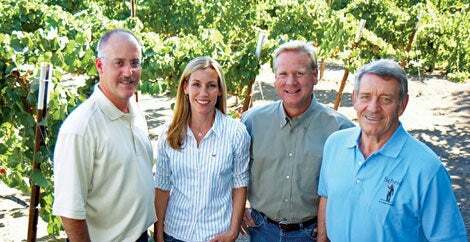 Al Scheid, who co-founded Scheid Vineyards more than 35 years ago, has passed his knack for business and winegrowing on to his son, Scott, and daughter, Heidi, who now serve as President and CEO and Senior Vice President of Scheid Vineyards, respectively. Despite all their success, they never lose sight of Vin, the iconic image who serves as a constant reminder of the truism that great wine begins in the vineyard.